A simple design works just fine. 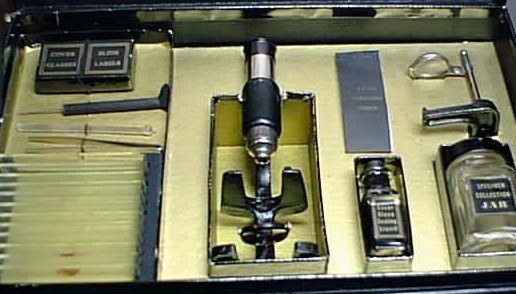 A microscope set from the 1930s. My small microscope set collection includes all kinds of different sets but none as simple as the 1930s Microset. This set, illustrated in figure 1, includes a diminutive compound microscope, a set of slides, collection bottles, magnifier and a couple of instruments plus the instruction manual. They are all packed very neatly in a small black textured box. The first impression that you get from this pre-WWII set is that it was built at a time when life was not too easy and money was scarce as it was in the depression era of the 30s. Only the very simple basic tools are included. Your next impression is that the microscope will not work and it’s just a little toy. That impression disappears when the microscope is taken out and a specimen is observed. To my great surprise this little instrument not only focuses easily but also shows images that are quite clear. 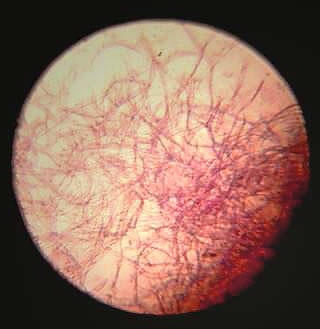 Figure 2 shows what it can do with a simple prepared slide of cotton fibers. The image was taken using an old fixed focus camera in the same manner that any child could have done it by placing the camera lens on top of the ocular. The 70x magnification is sufficient to do an excellent job of showing most of the specimens that the instructions refer to. The little microscope is all metal with glass lenses and a very small mirror that works even though it has lost some of the reflective material (see figure 3). The magnifier also strikes you as a useless item the first time you see it but when it is removed from the case and used, it works very nicely with no distortion from the glass lens! The slides are all large enough to fit even a professional microscope stage. A small booklet of lens cleaning paper is included too. 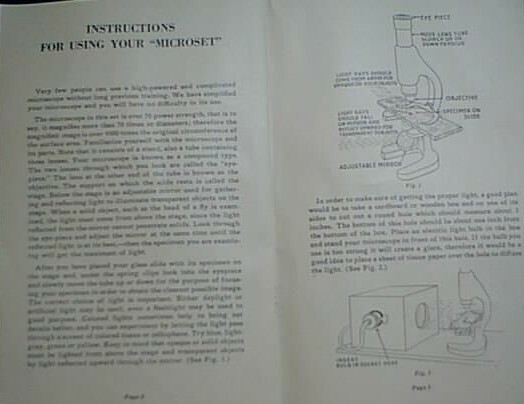 The instruction book includes enough exercises to keep a budding microscopist busy for a while. It also has specific instructions on the use of the microscope and magnifier. A sample of the instructions is in figure 4. One thing that one has to keep in mind is that even after 60+ years this microscope still works as good as new. Upon arrival the condition of this microscope was almost mint. In fact all I did was to clean the optics that were a bit clouded by dirt and grime accumulated over many years. This little set demonstrates that children’s microscopes of yesteryears were usable instruments capable of providing reasonable optics and more realistic magnifications than many of their successors. In the hands of a curious child this small and simple microscope coupled to the magnifier became an effective though inexpensive educational instrument. I must add that the instructions are much better than what I see today in new sets that sometimes do not even have appropriate explanations on how to use or what to do with the microscope. The Russians manufactured a simple 60x compound microscope of very good quality back in the 70s and 80s. 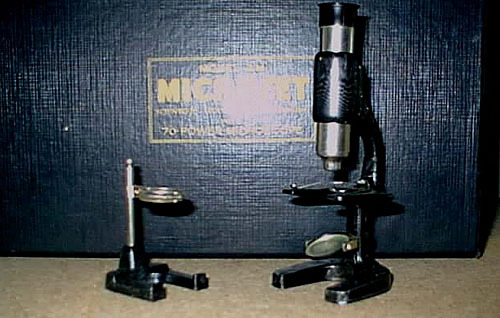 It sold under the name “Naturalist Microscope” and came with a simple set of tools not unlike the Microset. Bausch & Lomb® has also provided a compound microscope of about 100x magnification and excellent quality but sold without an accompanying set of tools. A new child oriented compound microscope set based on the same principles as the one described in this article, sheer simplicity, good optics and realistic magnification, must be designed, built and provided at a reasonable price with a simple set of tools and well written instructions or maybe even a CD explaining about microscopy and the use of the microscope plus a set of experiments and images of what can be observed with the microscope. Such a set will give a boost to microscopy and science and will revive the interest in science sets for children. In conclusion many microscope sets manufacturers of today could learn a lot by looking back 60 years ago to the Microset and by applying the old rule “simple design works just fine”. Who will take the challenge? All comments to the author Comments to the author sent via our contacts page quoting page url plus : ('gsantacana','')">Guido Santacana are welcomed.